Lexus is not an unfamiliar moniker to South Africans and its products are great with a reputable reputation for being reliable, luxurious and green-friendly; hence the automaker’s decision to expand its stunning IS range with the introduction of a hybrid variant. Lexus is one of a few manufacturers to have a hybrid variant for each of its model ranges. This latest addition to its green-friendly fleet will greatly support its aim to be one of the world’s leading hybrid vehicle producers. In 2013 Lexus introduced the first hybrid model to the IS range, with small alterations introduced in 2016/17 to keep the vehicle fresh for the last phase of its life-cycle. That cycle is ending this week with the introduction of the new and revised IS hybrid model. Sporting a naturally-aspirated 2.5-litre petrol engine, the IS 300h is available only in SE trim level and does it feature a strong specifications list to boost its value-for-money proposition in our market. Interestingly, Lexus South Africa says that, globally, Toyota/Lexus they’ve sold more than 12-million hybrid vehicles since 1997 when the Toyota Prius was first introduced and that last year they sold a staggering 1.5 million hybrid vehicles. These are amazing figures and underlines Toyota/Lexus’ 50% market share of hybrid vehicles sold globally. Guess that it only makes sense then for the automaker to introduce hybrid models to our market. The IS 300h has the same design language as the rest of the IS range, with only a few alterations made to the package for a bit of diversity. Design-wise Lexus’ new grille that fans out like an hourglass has been retained, but the diagonal bars running across it sees a 3D effect added to it. The side inlets on the front bumper have been widened, with daytime-running LEDs fitted as standard below the headlights. Added to the package is a sunroof, but in Lexus terms, it’s a moonroof. However you want to call it, the mechanism used to operate it has been altered for a quieter sound when in operation and the glass itself will reduce 96% of harmful UV rays. To differentiate the hybrid model from the rest of the range, the rear bumper sees the exhaust hidden behind the bodywork and the design of said bumper taking on an arch-like trait. The petrol models (no diesel will be added) sees the exhaust outlets quite evidently and the rear diffuser features an unmissable design. Those familiar with Lexus' products will not find the interior unfamiliar but will instead see their hands gliding over the dials and switches as if by instinct. Atop the dashboard sits a colour screen from which all relevant information is relayed and in front of the driver the information cluster for all driving information. The controls and dials are ergonomically designed but the pad from which to operate and access settings are too sensitive. This is a different take to what the IS’ German rivals are offering but should users find their way with and around this feature after some time. In terms of technology, the IS 300h comes standard with Lexus Safety System and, in addition, pre-collision system, adaptive cruise control, lane departure alert, automatic high beam, and blind spot monitor. The package is further enhanced with 17" run flat tyres; this to accommodate the battery for electric power. The hybrid’s engine delivers a power output of 133kW and 221Nm, but when the electric motor/battery kicks its power is upped to 164kW. Torque remains unchanged. An eight-speed CVT gearbox channels power to the wheels. In order to drive in EV (electric vehicle) mode, the battery needs to have enough power to propel the car forward. This mode works best in traffic or when the vehicle is moving at a slow pace and the accelerator is not pressed too deep; otherwise, it’ll switch over to normal (read: petrol) mode. In EV mode, the car produces no sound and it is almost eerie. At least there's self-gratification to be had knowing that you’re saving the planet kilometre after kilometre - the claimed fuel economy for this car is 5.0-l/100km and the C02 is only 117g/km. Three driving modes - Eco, Normal, Sport - can be accessed easily with the dial of a knob and alters the responsiveness of the vehicle accordingly. The steering is good when just plodding along, but feels vague and numb when going around bends at speeds, but that is somewhat pushed to the back of your mind by the fact that the chassis feels assured and sturdy. The overall drive in the IS 300h is quite well and apart from some wind noise at the rear windows, cabin quietness also sees a thumbs up. 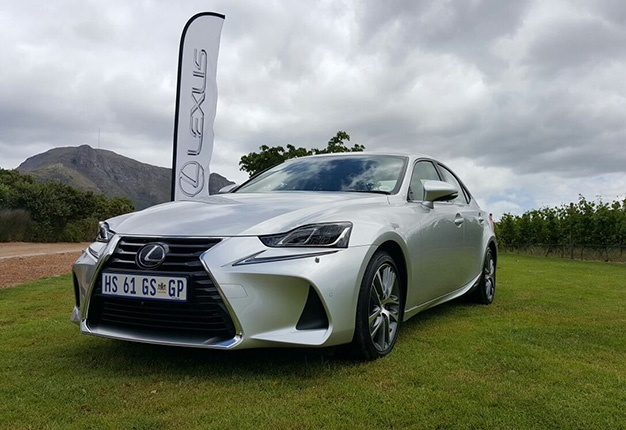 With a price tag of R753 800, the Lexus IS 300h is not a cheap car, but it has all the bells and whistles you’d come to expect from a premium manufacturer. For the most part, the car is better kitted than its rivals and is the only option you have to spec the colour you want your IS 300h to be in, according to a colleague. It is rare that a premium manufacturer offers you such a comprehensive package and does it almost seem as if you should look twice in case you missed something. But you’re not and does the car come standard with a seven-year/105 000km warranty and full maintenance plan which, Lexus says, is the best in its class.